This blog’s purpose is to introduce silent films in way that makes them seem familiar and fresh. I hope it can be one more step in opening readers’ eyes to a new realm of beautiful, brilliant, transformative filmmaking. So Sherlock, Jr. is an easy recommendation for me. It is indeed beautiful and brilliant; not just for its gags, but also for the innovative, wholly integrated, special effects employed by its star, Buster Keaton. They still work. In fact, the whole film still works. Go see it. Go rent it. Rent it twice. But please keep reading, because this film is special in another way. Out of all Keaton’s films, I think Sherlock, Jr. may offer the best lesson in the core principles of silent story-telling, thanks to the expressiveness of the actors’ bodies, the iron-clad logic of the plot, and Keaton’s selection of scenes. This is the blood and bones of the cinematic art. It begins simply enough. Keaton plays a ‘Boy’ in love. The ‘Girl’ (Kathryn McGuire) loves him back. We know it by the tender way she acts when he’s around. We know she’s genuine, because she is wealthy and he’s a flat-broke projectionist at the local movie theatre. Only two things drive him: winning the Girl’s heart, and becoming a great detective. The Boy’s detective dream is doubly funny because he’s clueless for much of the film. His attempts to woo the Girl are admirable, but really, he’d already won her heart before the movie even starts; only shyness holds him back. His more immediate challenge (and for us, his only one) is to clear his name. You see, Buster had two bucks. He went to the candy store to buy the Girl a box of chocolates and saw the best one cost three. ‘Will you give it to me for two?’ he asks the sales girl. ‘Sorry, I can only charge three,’ she replies. He ends up buying a one-dollar box, but changes ‘$1’ to $4’ with a pencil. The Boy made sure the Girl saw that price when he visited her house. He also gave her a ring topped with a near-microscopic stone, which she liked anyway, especially after she borrowed his magnifying glass to see it better. As a budding detective, the Boy carries his magnifying glass and ‘How to Be A Detective’ manual with him at all times. This was wise preparation. Not long after the Boy arrived, the Girl was visited by a second suitor, the sleazy ‘Sheik’ (Ward Crane). The Sheik spied the couple from the hallway of the house, and decided not to make his entrance until he could trump the Boy’s gifts. Since he’s really a two-bit crook, he stole a pocket watch from her father’s blazer, pawned it for four dollars, and bought her the three-dollar chocolates. Now, when the Girl’s father discovered his watch missing, the Boy promised to solve the case. Unfortunately, the Sheik was a step quicker—he planted the pawn shop receipt in Keaton’s coat, and so when the Boy himself was searched, it appeared the receipt was his. The amount on the receipt was four dollars—which, of course, was the cost of the chocolates the Boy gave to the Girl, at least, after he changed the price. The Boy’s ring was returned, and he was banished (forever?) by the tearful Girl. With special effects and grand gags still to come, this early scene is not the most memorable part of Sherlock, Jr. But it’s a terrific example of how to communicate precise information without dialogue. Keaton’s scene in the candy shop is performed entirely in pantomime. 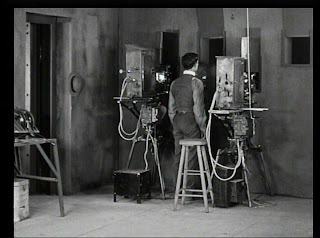 His framing at the Girl’s house takes place with minimal intertitles, relying instead on the audience’s ability to connect a pair of number-fours. Because the camera shows both the doctored candy box and the receipt, the gag is clear. Note also how Keaton is intent on integrating every gag in a logical way, consistent with the character and his goals. Keaton gives the Girl a ring because he loves her; it is small because he’s poor; she tries to appreciate it because she loves him; he gives her a magnifying glass because he wants her to appreciate it, but also because he’s a detective, and can be expected to carry one. Lesser comics would have settled for an unexplained magnifying glass—and a displeased recipient of the ring. Back in the projectionist booth, the Boy mopes. Then he falls asleep, and so begins Sherlock, Jr.’s succession of technical wonders. The featured movie this night is ‘Hearts and Pearls,’ the story of a stolen necklace, a lovely socialite, and a cad. As the Boy slumbers, we see a ghostly version of him rise to attention, and the characters on-screen transform into the actors from the previous scenes. Crane remains the villain and thief, now with a butler (Erwin Connelly) as his accomplice. McGuire is the socialite. 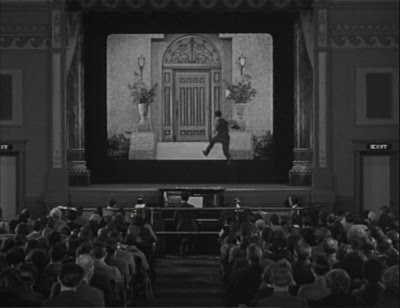 The Boy’s doppelganger sees what’s going on, climbs down from the projectionist’s booth to the front row of the theatre, and then into the film itself. Unlike the others, the Boy’s personality is transformed along with his identity—and that’s appropriate, given his poor grasp of reality thus far. He is now ‘Sherlock, Jr.’, world-famous detective, decked in top hat, tails and cane, called upon to recover the missing necklace. Sherlock, Jr. is no clod, and cannot be bullied. He gives everyone in the house a narrow-eyed assessment, including the Girl. He almost sniffs them for clues. The Sheik and the Butler take him seriously, too; so much so that they devise three methods of killing him: poisoned drink, booby trapped chair (beneath a decorative battle axe on the wall), and exploding billiard ball. Sherlock, Jr. truly is the man the Boy wishes to be—he evades each of these traps with smooth ease. Meanwhile, the Sheik and the Butler nearly fall victim to their own machinations. The villains escape and capture the Girl, setting up Sherlock, Jr.’s last act. 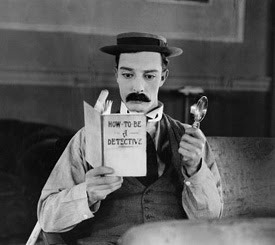 Joined by his assistant, Gillette (Ford West), the detective infiltrates the crooks’ hideout, but cannot locate the Girl. He then escapes the Sheik through a pair of ingenious sight gags. The first sees him dive through a window and land on the street, instantly disguised as a woman; the second has Gillette in disguise, holding a street vendor’s suitcase, into which Keaton ‘dives’ to escape through the wall behind them. You’d call the editing here flawless, except there probably wasn’t any—Keaton perfected both of these gags on the vaudeville stage. Like several other Keaton films, Sherlock, Jr. ends with an elaborate chase, though this one starts pretty oddly. Sherlock is on the run when Gillette arrives on a motorcycle to give him a lift. Sherlock then sits on the handlebars, facing forward,. However, the pair hit a mud puddle early on and Gillette is thrown off the still-moving bike. Sherlock is unaware of this and speeds a through construction site, an Irish bachelor party, and a picnic; over a bridge and two trucks, in front of a train and under another truck, all the while unsteered. It’s the movie’s best scene. I won’t give away the ending to Sherlock, Jr.; I’ll just say it’s a satisfying one, and totally within character for everyone. We expect no less, of course. Among all his other talents, I think the Keaton touch is best felt in the respect he gives his audience. He knew he could get a cheap laugh from lesser material and cardboard characters, but he wouldn’t give us something that wasn’t good enough for him. And being a genius and all, his standards were pretty high. So return the favour and go see Sherlock, Jr. Go rent it today. The rent it again, some time. Kino International’s The Art of Buster Keaton box set (also available as individual discs) packages Sherlock, Jr. with Keaton’s 1923 film, Our Hospitality. Look for it here. Buster Keaton is my favorite actor of all time. He is, in a word, brilliant. Can anyone identify the actor that played the pawn shop owner? Hey! I'm new to your blog and a big fan of the way you write. Keep up the good work! It's because of people like you that keep youngsters like us from watching such classics :) Thank you once again..